On the 25th April 2015, the Gorkha earthquake is the deadliest disaster to strike Nepal. It has claimed more than 7000 lives and injured more than twice as many. Not only has the earthquake killed many, hundreds of thousands of houses were destroyed leaving the surviving people homeless with entire villages flattened, across many districts of the country. 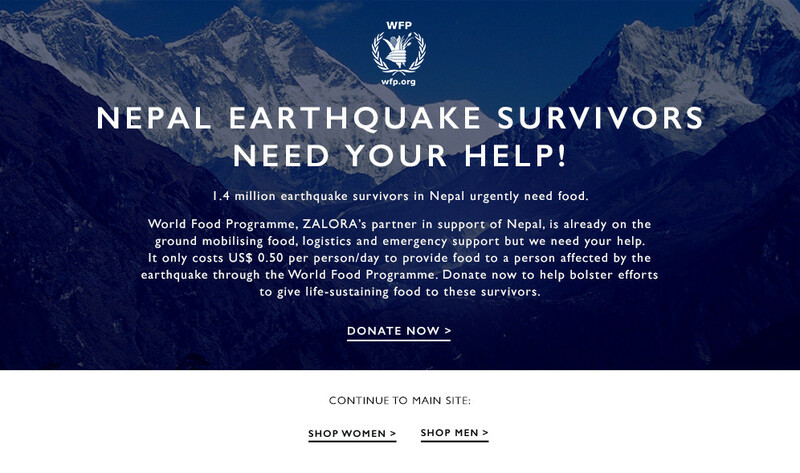 The ZALORA movement is a charitable cause that aims to lend a helping hand to the people in need. A little help from you could ultimately save a life. All it takes is just one click to make a donation! World Food Programme, ZALORA’s partner in support of Nepal, is already on the ground mobilizing food, logistics and emergency support. However, it is not enough. We need your help to aid the victims who has suffered the wrath of Mother Nature. It only costs US$0.50 per person/day to provide food to a person affected by the earthquake through World Food Programme. Let’s all come together and lend a helping hand and donate to Nepal.